Storytelling provides a powerful means to obtain information and learn about the best practices and impact of projects and activities of grassroots groups from community members’ experiences and viewpoints. The narratives offered by provide meaningful information that can highlight both the strong points and weaknesses of a project, as well as any unintended consequences. Storytelling can bring out rich, colorful, and emotionally compelling information. Sharing and listening to stories builds bonds of trust and opens doors for relationship, which is essential for creating change. The storytelling approach to information collection and reflection is usually done through an interview or question and answer format, with notes taken or an audio and video recording. Using storytelling, trained local staff and volunteer leaders can interview community members (leaders) about their experiences in carrying out interfaith bridge building and community-based humanitarian actions that address the causes of conflict. At the same time, perhaps even more effective is to utilize storytelling to learn about the experiences of intended beneficiaries in a project or activity, rather than from just those who implemented it. In general, at the United Religions Initiative (URI) storytelling is used to collect information from out grassroots groups, Cooperation Circles by local URI staff and volunteer members of the community about how their peacebuilding activities and the impact of their peacebuilding work. It is also a collaborative learning tool, which enables grassroots groups and URI as a network to better understand the benefits of belonging to URI or of being a participant/ beneficiary of URI activities, the impact on their communities, and what URI and grassroots Cooperation Circles might do to improve. Faith Inspired Reflection: At the United Religions Initiative storytelling is our primary method of building bridges within and between people of different cultures and religions. Storytelling is an ancient form of the transfer of wisdom, conflict resolution and community-building which can be seen in all religious, spiritual and Indigenous traditions. Using storytelling as the primary methodology for data collection empowers a community to use a natural and trusted tool to share their experiences as part of the learning and impact evaluation process. The United Religions Initiative is an interfaith organization comprised of people from a wide diversity of religious, spiritual and Indigenous traditions. Therefore, our practices must reflect those which can easily been identified as familiar. In addition, URI’s commitment to community-based empowerment means that all engagements with grassroots communities must be for mutual benefit. It is our belief that the wisdom essential to create cultures of peace, justice and healing are help within grassroots communities, and that as a global organization, we must act towards all communities in ways that honor and respect this belief. The United Religions Initiative trains and mentors local grassroots staff and community members in how to collect stories though a variety of practices which offers data that feeds and energizes URI’s global network, and provides a mechanism for evaluation, earning and impact assessment. URI’s commitment to empowering grassroots communities to create cultures of peace, justice and healing in their own communities has led a community-based model for data collection which is centered on story telling and story collection. URI’s data collection system is based on the principles that wisdom from grassroots communities is the information that fuels the whole URI network. Training local staff and community leaders as story collectors. URI uses a variety of different mechanisms to gather quantitative and qualitative data for purposes of community empowerment, reflective learning, evaluation and impact assessment. 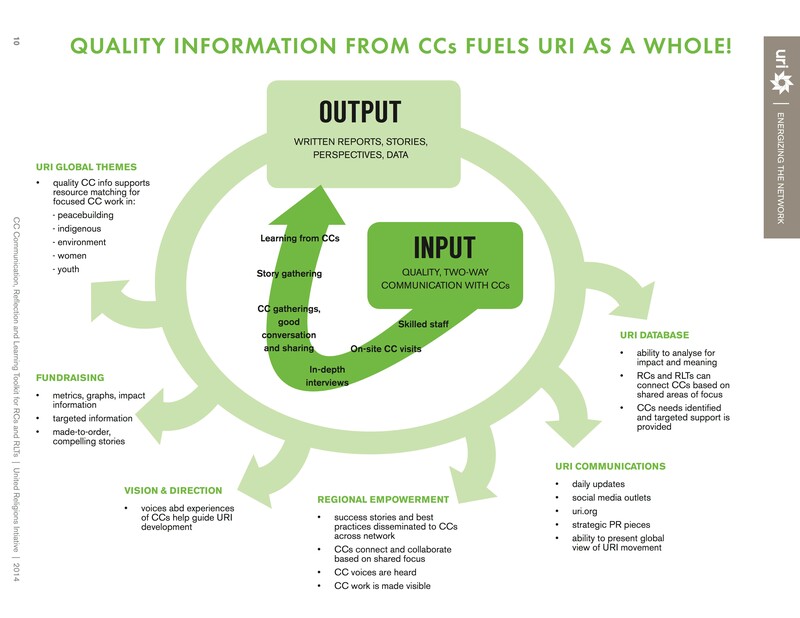 The following model illustrates the various ways in which gathering information (INPUT) through quality two way communication with Cooperation Circles (CCs) produces the OUTPUT in the form of written reports, stories, perspectives and other data that feeds all aspects of URI as a global organization (database, communications, regional empowerment, vision & direction, fundraising and global themes. Local staff and grassroots leaders are identified and trained in a variety of methods of data collection including storytelling and story collection. The process begins by working with grassroots communities and local staff to identify individuals who will be trained as data collectors. It is crucial to us that this is a collaborative process and that the data collectors are from the local communities. Stories Belong to the Storyteller: Stories and reports on interviews, focus groups and other data collection methods should be in the voices of the storyteller, not the story collector. Do not replace your voice for that of the storyteller by offering interpretation or rewriting. Be consistent and systematic: Create a template to record the stories, and allow sufficient time to write them down. It is strongly recommended to record stories when they are fresh in your mind rather than to go back and recreate them in order to preserve the voice of the storyteller. Help Storytellers to Assist Others in Telling their Stories: Everyone has a story to tell, but not everyone is a good storyteller. Identify the good storytellers among the Cooperation Circles and community members and encourage them to tell their stories and also to help other, less skilled storytellers to give voice to their stories out. All Stories are Important: Even though some stories may seem to suite the purpose of evaluation and impact assessment, every story told by Cooperation Circle members or program participants should be honored as part of the story collection process. Stories may not always be success stories. Certain stories illustrate problems and challenges encountered; others may demonstrate successful interventions; and still others may highlight the particular needs, assets, and resources of CC or the communities they are working in. Stories may not tell “the whole story.” It is important that you complement the stories you include in data collection reports with other sources of information. Stories should be combined with surveys/questionnaires, focus groups, observations and other methods of evaluation. Providing multiple forms of data will enhance the quality of evaluation as well as the richness of the whole story. Consider the ethical implications of sharing personal and institutional stories. Story telling is a sacred process. It involves a level of vulnerability that needs to be respected. Explaining how stories will be used before the storytelling process begins is essential. Always ask participants for permission before recording their stories. Also get their approval to share their stories with others, explaining that if they choose, their real name will not be used in connection with their stories. There are a number of methods that can be used to collect stories from Cooperation Circles about their peace and justice activities. All of the standard social science methods such as surveys, questionnaires or interviews, as well as participatory techniques like focus groups, are utilized in establishing a baseline in understanding the work of Cooperation Circles. Each of these methods can be implemented individually or in combination with each other depending on the need. Quantitative methods are used to gather data to be analyzed in statistical form. Qualitative methods have greater flexibility and pose questions in a more open-ended manner. They give an in-depth understanding of WHY people participate or hold particular views, not just THAT they participated. Involves creating a space where community members can freely share their experiences in confronting conflict and building peace in their communities. Story Telling Circles can use a variety of processes including Appreciative Inquiry, Samoan Circle (Fishbowl exercise ) and other methods natural to local communities. Involves speaking with people in the community who have familiarity with its history and how it has changed over time. The voices of the people in a community can help describe the historical, social, and cultural context for Cooperation Circle activities/programs, and how the community has evolved over time in the work of peacebuilding. Involves watching, taking notes, and recording specific actions within a target community, such as communications, interaction, or exclusion. The observation can be focused on an activity or project in which the people participating in the action are observed. For example, observing cultural diversity at an event or activity provides direct information on participant characteristics. It can also be focused on changes, such as in people’s behaviors and attitudes, which involves watching people go about their daily business at home, in the community, or in the field. How is being a member of URI help your Cooperation Circle to achieve its goals? How can URI better support your Cooperation Circle to reach its goals? As an organization, what can URI do to increase impact? think about an issue, service or idea. Focus groups have a specific purpose, size, composition, and process. They are best conducted with 6-8 people who are selected because they have something in common. Leading focus groups requires a skilled moderator and is best done in a comfortable, confidential environment. Focus groups are a compromise between participant observation and more in-depth interviews. Involves a set of specific, targeted questions to which stakeholders respond in writing. The questions must reflect cultural awareness and be language sensitive in addition to fitting within a set of formal methodological standards. Questionnaires can be distributed electronically, by post, or by hand. Involves narrative descriptions of a personal experience. They may be open-ended to allow individuals to capture what was of importance to them each day or week, for example. Participant diaries can also be structured so that individuals take note of specific attitudes, events, behaviors that they have experienced/observed in the allocated timeframe (e.g. daily, weekly). Involves utilizing photographs or video to collect visually represented information such as interfaith/intercultural collaboration. One new methodology being tested is self-recorded video diaries in which community members record the telling of stories about peacebuilding int heir communities. There are several ways in which data has been stored and shared at URI. [We are currently completing a major integrated technology project and in the midst of developing a new impact assessment program, both of which will greatly expand this step in our program.] Information about URI’s Cooperation Circles is currently stores in a central database. However, the database was not designed in ways that allow us to extract data for evaluation and impact purposes, so we are moving to a new data management system designed specifically for the whole URI community to access this information and extract data in ways that further learning, evaluation and impact assessment. Currently information from URI’s Story Telling and Story Collection program comes to URI from local staff in the form of Cooperation Circle Profiles. These profiles are first person narratives derived from interviews and other story collection practices. The first set of Cooperation Circle profiles can be found at http://www.uri.org/cooperation_circles/cooperation_circle_profiles. These early profiles have been a way to begin the process of best practices sharing in an open source forum. Every URI Cooperation Circle will have an online first person profile available for the whole community. Key to the next step in using data collected through the Story Telling and Story Collection program will be the development of a system to code stories to explore the impact URI’s grassroots peacebuilding efforts on individuals, local communities, countries and regions. In the fall of 2016, URI will launch the Impact Assessment and Learning Working Group which is charged with developing a system for coding narratives drawing on narrative-based impact work being currently done in areas of multicultural and global learning.